Does the logo shown above look familiar? No? What about now? 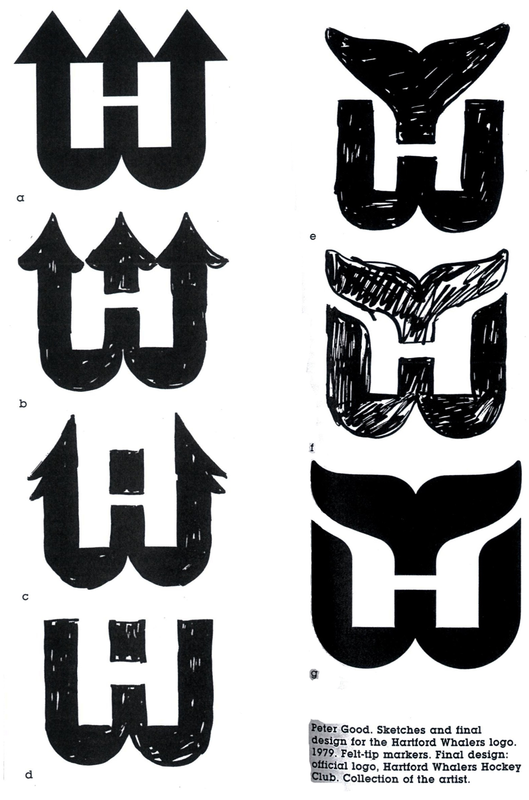 The first design is actually an early version of the mark that eventually became the Hartford Whalers logo. In fact, the triple-pointed design was presented to the team and accepted, but the designer, Peter Good, thought he could improve upon it, so he went back to the drawing board. You can see the progression from that first mark to the final design in these sketches, and Good’s creative process is described in this text. All of that comes from an early edition of this book, which the pseudonymous Hungry Hungry Hipster was kind enough to scan for me, providing us with a rare look at the evolution of a great logo. Uni Watch News Ticker: Arizona’s white helmet is apparently more than a rumor (with thanks to Kenny Abbey). ”¦ Here’s a classic — Casey and the Lip lighting up. That’s from a small assortment of baseball-themed tobacco ads that Bruce Menard sent me. Bruce’s favorite is this one. “There’s so many things wrong with that ad, but a kid in bell-hop uni extolling the virtues of ‘No cigarette hangover’ to the Yankee Clipper is just too funny (or sad, depending on your point of view).” ”¦ Worst soccer uniforms of the decade listed here (with thanks to Benjamin Graff). ”¦ Completely cringe-inducing yet oddly compelling video clip about Bill Belichick’s cut-off sweatshirt sleeves here (with thanks to Dave Montgomery). ”¦ A small item at the bottom of this page notes that Bowling Green will be wearing white over white in the Humanitarian Bowl (with thanks to Tom Konecny). ”¦ Whoa — the Swinging Friar lives! Pretty good likeness, eh? 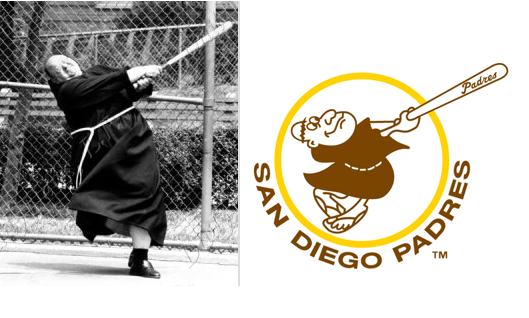 The logo version dates back at least to the 1950s, when the Padres were a minor league team, while the photo is from 1966, so this is a case of life imitating art, not the other way around (amazing find by Bryan Grupp). 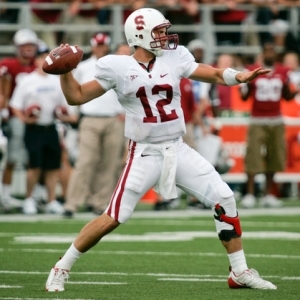 ”¦ RNOB in last night’s Poinsettia Bowl (thanks, Phil). ”¦ If you go to this page and scroll or drag the content so you can see the right-hand side of the page, you’ll find an article about the Phillies’ 1986 St. Paddy’s Day uniforms. It’s hard to be sure, but the article sort of implies that the green unis were a new thing for that year, which doesn’t jibe with what Morris Levin had always thought: “I thought the Phillies had first worn these in 1981. That’s how Mitchell & Ness dates theirs, although I’m not positive that was accurate. Tug McGraw is often anecdotally credited with introducing this to the Phillies when he dyed his uniform, but in this article they say Phillies owner Bill Giles had the idea.” Hmmmmm. 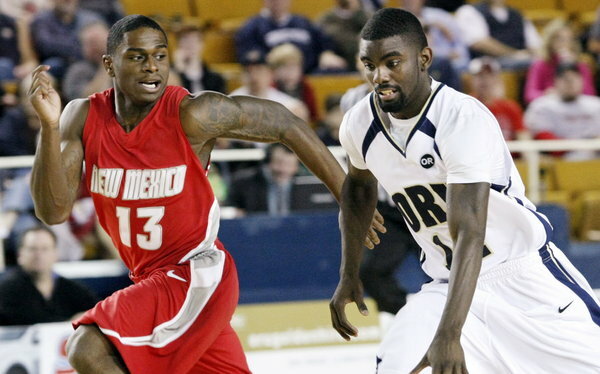 … The Oral Roberts hoops team has added an “OR” memorial patch for the school’s founder (with thanks to Ryan Atkinson). ”¦ Five NBA games on tap for tomorrow. 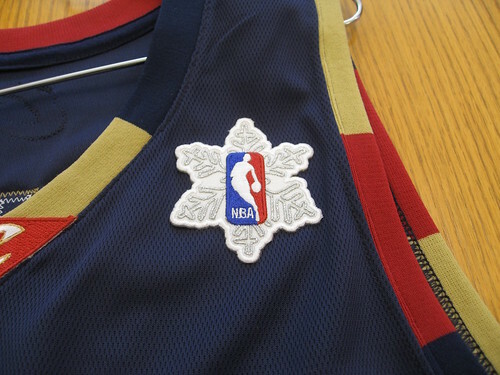 All teams will be wearing the snowflake patch, plus the Knicks and Heat will wear green and red, respectively. Not positive, but I think several teams may be wearing red/green sneakers too. Holiday Schedule: The site will be open for chatter tomorrow, and Phil will have his usual multi-course feast on the weekend. Uni Xmas to all, and to all a striped stocking. From a sports fan’s perspective, Christmas hasn’t been the same since the Blue-Gray game hasn’t been around! I guess I’ll take the NFL game or force myself to watch the NBA! I miss the Blue/Gray game as well the pre-Christmas dinner tradation in my house was to pick out as many different hemlets as possible and try to figure out what school they were. This was not as easy in the Pre-ESPN days as you would only have a couple of games on TV on Saturday so you would not see all the helmets during the year. Great Memories. Also. Merry Christmas to Paul, LI Phil and the rest of the Uni-Watch family. I can’t see why on earth Arizona would choose to switch to white helmet in a game against a team that also wears white helmets (Nebraska). I’ve never been a QB, but isn’t easier to see your receivers if they have different color helmets that the defenders? 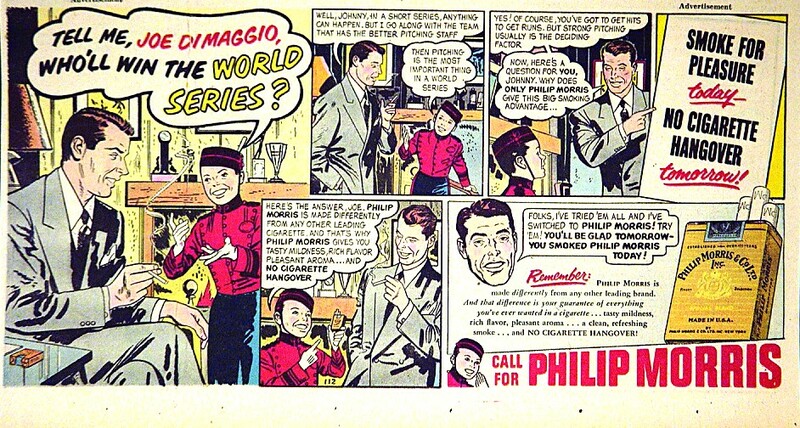 I love the ad with Joltin’ Joe extolling the virtues of Philip Morris cigarettes to a young bellhop. The kid didn’t even ask; Joe D. brought it up first! [quote comment=”368401″]I love the ad with Joltin’ Joe extolling the virtues of Philip Morris cigarettes to a young bellhop. The kid didn’t even ask; Joe D. brought it up first! The “young bellhop” was Johnny, the midget (as they used to say) national pitchman (as they used to say) for Philip Morris. He was a celebrity in his own right; a much bigger deal than today’s mascots. I thought he was a kid until I saw him in person in 1956, at Grand Central Terminal in NYC, where I worked. [quote comment=”368403″]The “young bellhop” was Johnny, the midget (as they used to say) national pitchman (as they used to say) for Philip Morris. He was a celebrity in his own right; a much bigger deal than today’s mascots. Here is a photo gallery of the top 10 goalie masks of the decade. I like how the neg. 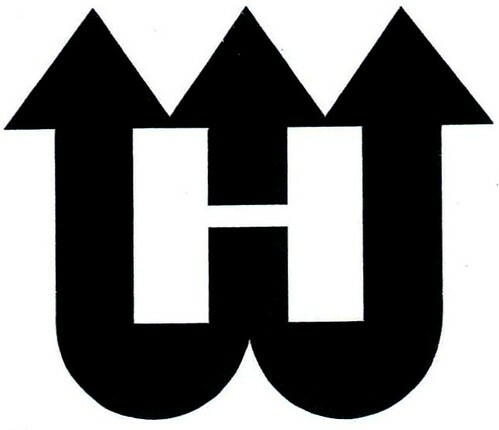 space “H” is a lot more pronounced in original Whalers logo. I grew up watching minor league hockey in Binghamton and that logo turned sideways, and this one doesn’t make a reasonable “B” like the final one did. 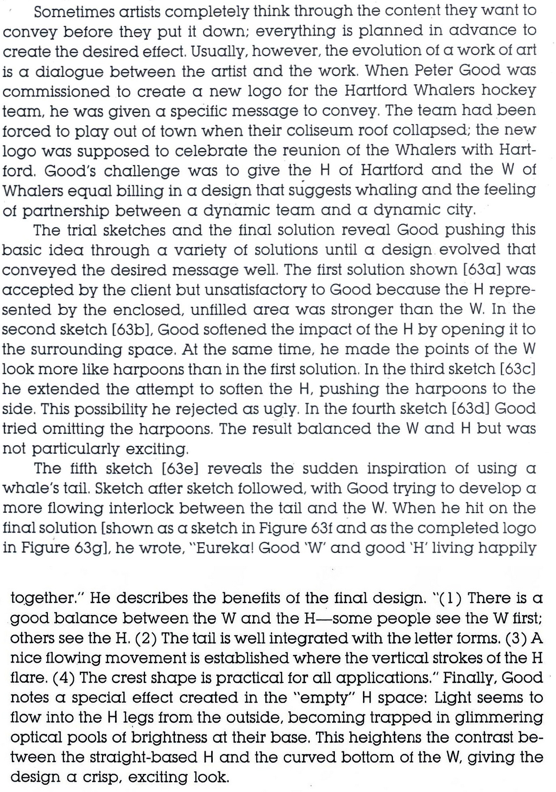 I didn’t see in the article where the first design tried to include the trident that was used in the WHA Whalers logo. I started teaching graphic design this year, and I really try to impress on my students that their first idea for a design is rarely (if ever) the best design. Thanks for this article! The swinging friar…. I’m speechless. Why didn’t they flip the colors? The negative space H is cool and everything, but if it represents a whale diving back into the water… shouldn’t the bottom of the logo have been blue? In a moment of clarity when I first woke up this morning I thought…”Wouldn’t it be cool if Navy’s football team was the Seals?” Get it? Navy SEALs? OK, maybe I should go back to bed then. Were the Reds the first team to go green for St. Patrick’s Day? [quote comment=”368403″][quote comment=”368401″]I love the ad with Joltin’ Joe extolling the virtues of Philip Morris cigarettes to a young bellhop. The kid didn’t even ask; Joe D. brought it up first! It was not a trident in the original whalers logo it was a harpoon. [quote comment=”368409″]In a moment of clarity when I first woke up this morning I thought…”Wouldn’t it be cool if Navy’s football team was the Seals?” Get it? Navy SEALs? OK, maybe I should go back to bed then. No, it wouldn’t be cool. You’d be leaving out all the other communities of the Naval Service (air, surface, submarines, Marines), of which the SEALS are an important but small part. [quote comment=”368413″][quote comment=”368409″]In a moment of clarity when I first woke up this morning I thought…”Wouldn’t it be cool if Navy’s football team was the Seals?” Get it? Navy SEALs? OK, maybe I should go back to bed then. I don’t see why the completely unnecessary military sports teams should have to be named to represent anything other than themselves, but calling them the Seals would just be cheesy. [quote comment=”368414″][quote comment=”368413″][quote comment=”368409″]In a moment of clarity when I first woke up this morning I thought…”Wouldn’t it be cool if Navy’s football team was the Seals?” Get it? Navy SEALs? OK, maybe I should go back to bed then. They may not, but Midshipmen represents the Naval Academy — and every officer-candidate in college for the Naval Service. [quote comment=”368412″]It was not a trident in the original whalers logo it was a harpoon. I, too, am also speechless. It appears that the Friar has pulled his left shoulder away from the swing zone, causing a decrease in circular hand path, and therefore a subsequent reduction in torque. For a batter to attain his maximum potential, his mechanics must make efficient use of both – circular hand path and torque. Great hitters generate great bat speed because their swing mechanics efficiently apply torque at the handle that compliments the their circular hand path. Ant-spam word was “toast” yummy!!!! [quote comment=”368416″][quote comment=”368412″]It was not a trident in the original whalers logo it was a harpoon. [quote comment=”368415″][quote comment=”368414″][quote comment=”368413″][quote comment=”368409″]In a moment of clarity when I first woke up this morning I thought…”Wouldn’t it be cool if Navy’s football team was the Seals?” Get it? Navy SEALs? OK, maybe I should go back to bed then. Likewise for Army, whose teams officially are the “Cadets”. Black Knights predates any particular military unit. It is a secondary nickname derived from a sportswriter long ago calling the football team “the Black Knights of the Hudson” (yet another jersey-color-inspired moniker). Every student at Army or Navy is a cadet or a midshipman, respectively, and, as correctly mentioned, those are the football teams for the academies, NOT that entire branch of the service. c) it at least references what that particular academy is it all about…flight. [quote comment=”368418″][quote comment=”368416″][quote comment=”368412″]It was not a trident in the original whalers logo it was a harpoon. Long ago I read a book on logo design, (really), and the one thing I’ll always remember the author saying is that a logo isn’t really great unless it can work as well in black and white as it does in color. The Whalers logo meets that criterion as well. I’ve always loved how just 2 graphic elements conveyed whale, Whalers, Hartford and hockey, (the 2 stick-blades that I see in the “H”). It took me 2 years to realize that it wasn’t a mutated Pacman, but when I finally saw what it was it was a great “AHA” moment. I love how the moon, river, star and tree-line elements fit into the animal’s head without feeling forced in there. Integrating the tail and horns into the “J” is simple and elegant, like the Whalers… just not as clever. On first glance, it looks like a harmless adapatation of the Toronto Maple Leafs. Then, on further review, its subtle genius is revealed. Now, these aren’t iconic, time-tested classics like the Packers, Steelers, Canadiens, etc. These are my favorites for reasons having nothing to do with their team’s history. In any event, given the readership of this blog, I’d be interested in the faves of others. If anyone answered “no,” they’re in the wrong place. Tackla may have (and probably did at NHL teams behest) changed their NHL pant products in the last few years but that wasn’t always the case as seen in this photo of Igor Larionov from the early 2000’s. Ok, I’ll bite. Exactly what subtle genius am I supposed to be seeing? I see nothing but words on a leaf. A good logo not only should work in black and white, it also should work large or small. What do the “M” and the “W” appear to be doing? And what’s the full name of the team? Old, old joke. What did Adam say upon seeing Eve for the first time? WFL produced a couple good ones. A bit static perhaps, but interesting. Here’s a question I’ve pondered from time to time – does the historic success of the team have anything to do with how the team’s logo and/or uniform is received? For example, would the Yankee’s interlocking NY logo be considered an ‘iconic’ logo if they had stunk it up for a century, instead of winning 27 World Series? Would uni fans revere the Canadien’s sweater if they hadn’t won any Stanley Cups? Ditto for the Colts, Packers, etc? Making Whoopee! See the newlywed game. I’d say almost certainly so. Also why they don’t change them–or their unis–just for the hell of it. Don’t forget the Houston Gamblers logo. I’ve always thought that was a brilliant one. And I had never, until today, noticed the H in the Whalers’ logo. But not always. How many Stanley Cups did the Hartford Whalers win? It’s the same number that the Blackhawks have won while wearing their current logo. Well there are certainly logos out there with no winning tradition that are significant graphic achievements (Whalers, etc). I think it’s tough to separate the history from the graphics in some cases too. Yanks, Habs, etc. Didn’t say was always, said was the case with the teams of the specific caliber mentioned. Sometimes a great logo or great uni gets love just for being great in and of itself. and why does it look like it was cut out by a kindergartner? Appear to be someone’s re-creations, not original material. Also, a UA alumnae pointed me toward this, which I know some of you will enjoy (http://azwildcatequipment.blogspot.com/) as UA gets ready to either wear or not wear white helmets in the Holiday Bowl. this post in particular talks about sewing the bowl patches on the jerseys. [quote comment=”368420″][quote comment=”368415″][quote comment=”368414″][quote comment=”368413″][quote comment=”368409″]In a moment of clarity when I first woke up this morning I thought…”Wouldn’t it be cool if Navy’s football team was the Seals?” Get it? Navy SEALs? OK, maybe I should go back to bed then. [bold]Likewise for Army, whose teams officially are the “Cadets”. [/bold] Black Knights predates any particular military unit. It is a secondary nickname derived from a sportswriter long ago calling the football team “the Black Knights of the Hudson” (yet another jersey-color-inspired moniker). Are you sure? I’m fairly certain Army did actually change its nickname to Black Knights back when it first joined Conference USA a few years ago as part of a “rebranding,” or something along those lines, as it were. Also led to an updated logo. This was one of the best postings in a long time. God Bless the Whalers story, the Belichick Video and the Swinging’ Friar Photo. I may be Jewish, but this was a great Christmas gift! 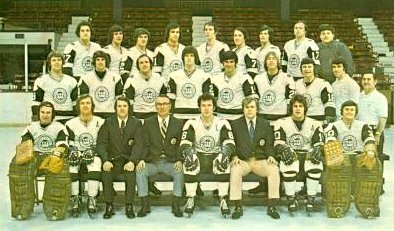 What was great about those original Whalers jerseys was the “negative” shoulder bar intruding down into the different colored sleeves, an integral part of the Redwings’ white jersey for decades. I absolutely love this effect. Sure, but that was won by the New England Whalers. I think Mr. Good’s first version of the Whalers logo, depicted at the top of the page, is the most striking and strongest of them all. [quote comment=”368447″][quote comment=”368420″][quote comment=”368415″][quote comment=”368414″][quote comment=”368413″][quote comment=”368409″]In a moment of clarity when I first woke up this morning I thought…”Wouldn’t it be cool if Navy’s football team was the Seals?” Get it? Navy SEALs? OK, maybe I should go back to bed then. Must have been about the time they decided to pass out a black beret to anyyone who finishes basic training, instead of having to earn one by being a Ranger. Typcial dumbass “but the kids’ll dig it” move. Either way, it owes not to a specific military unit, but to a longstanding nickname spawned in the media, and that was my central point. Totally agree Ricko – while not a fan of the team, I do have a Wings jersey that I proudly wear for my Wednesday night hockey games. A true classic. Agree that the Whalers logo is at or near the top for best sports designs. Best logo design ever? It might be in a top 10 or so but there are some phenomenal logos out there globally IMHO. Take FedEx for example – brilliant inclusion of the arrow. Sums up the FedEx brand in an instant (for those that see it…), which the Whalers logo does to but FedEx has much broader reach. BTW – I thought the original Whalers logo was great too. Respectfully disagree on the Wild being a top 5er (and I live in MSP). I’ve always thought while “clever” it was very contrived. A good (no great) design should not appear contrived or forced but should almost appear effortless. I am a Wild fan too but the North Stars were always my team so “Wild fan” might be a bit strong (and I hate the name Wild). A happy and safe holiday to everyone in Univille. It’s absolute absurdity and inventiveness are second to none in the realm of corporate sponsorship. Not to mention it’s subversive negating of the ridiculous post-goal celebration trend of pulling your shirt over your heard thus hiding not only the player’s face but the team logo as well. Except that it’s a trident of sorts, which has a far broader context (the sea, Neptune, etc.) to whaling than the tail of a whale. Hey, kids! Happy holidays to one and all during this festive season. If you want to read a hockey-themed ‘Twas the Night Before Christmas, I’ve posted why I love the Christmas season over on the blog. As the snow falls outside, please take care this holiday season, and don’t drink and drive. I want to see everyone back after they’ve opened their gifts and celebrated with their loved ones. From me to you, Merry Christmas, Uni Watchers! And I’m outta here, too. 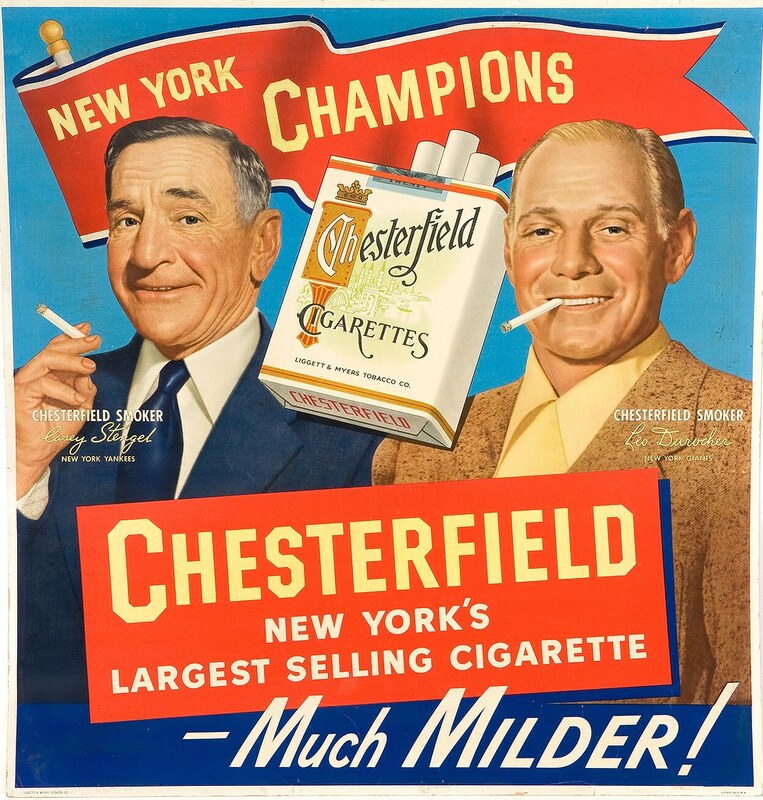 How about Desi(cancer victim) and Lucy(heart disease),pushing Phillip Morris/ complete with Johnny? Twas the night before Christmas, when all through Miller Park, not a creature was stirring, not even a mouse. [quote comment=”368463″]Twas the night before Christmas, when all through Miller Park, not a creature was stirring, not even a mouse. Hope this isn’t a stupid question but whats going on with the field? Is the grass/dirt covered in plastic? If it is, why? Assuming its a COLD thing, right? [quote comment=”368465″][quote comment=”368463″]Twas the night before Christmas, when all through Miller Park, not a creature was stirring, not even a mouse. Adam, not so much a question about the Brewers but about the park. I live in Milwaukee and I drive past Miller Park every day. It’s December — why has the roof been open since the end of the season? — Andrew S., New Berlin, Wis. The grass needs sunlight, even in the winter when it’s not growing. Gary Vanden Berg, the Brewers’ longtime head groundskeeper, explained this and so much more in a post at John & Cait Plus Nine, an MLBlog maintained by front office staffers John Steinmiller and Caitlin Moyer. When you’re not reading Brew Beat or following me on Twitter (@AdamMcCalvy), I highly suggest you give them a look. The Grounds Crew spent the morning covering the field with special turf covers (which help keep the grass from turning yellow, keeps the grass a little warmer and, in times of sunlight, can act a little bit like a greenhouse) and placing sandbags down to keep the covers from coming loose. They also placed 2″ insulation over the infield dirt to help make it more playable come spring; the insulation prevents the frost from going as deep. Lousy YMCA wi-fi blocks photobucket? That was a really interesting blog. I had no idea that teams would til up the infield in the off-season and re-mix the consistency of the dirt. That’s really amazing. Im still searching for photographic evidence but I’ve noticed some uniform inconsistencies for the NC State Wolfpack basketball team. It seems that all upperclassmen have radially arched nameplates, but Freshman have been given straight nameplates. Additionally, it seems their font is much larger. [quote comment=”368467″][quote comment=”368465″][quote comment=”368463″]Twas the night before Christmas, when all through Miller Park, not a creature was stirring, not even a mouse. Are you kidding me? the only thing which interest me anywhere near as much as uniwatching is my interest in groundskeeping. That article is great stuff, my mind is churning with all kinds of questions that I’d like to ask. Another thing that I’m crazy about is the background/preparation in sports, eg: what equipment managers and such do to prepares for games. You would have loved the job Barry Keast had to do for the old California Golden Seals – among his clubhouse duties was painting the Seals’ skates white every few games! They were known for their white skates during the green-and-gold-garbed Charlie Finley era, but they also wore at different times yellow skates with green trim, green skates with yellow trim, white skates with green trim, and of course the all-white with green laces! Great video. And J.P. II was a good athlete as well as a great human being. Speaking of great, everyone have a great Christmas Eve and Christmas morning. Peace. [quote comment=”368460″]Hey, kids! Happy holidays to one and all during this festive season. If you want to read a hockey-themed ‘Twas the Night Before Christmas, I’ve posted why I love the Christmas season over on the blog. Two sips from the cup of human kindness and I’m shitfaced — just laid to waste. Youre the man Paul, thanks and Happy Holidays! Please remember, it isn’t the thought; it’s your reaction that counts. In sports uniforms we trust. Thank you for the great Christmas gift of the Whalers concepts! I love that logo and this made my night. I just slapped my forehead as in a V-8 vegetable juice commercial… as in how could I have forgotten to include the Milwaukee Brewers’ m/b baseball glove in my top 5 faves of all time? Ok… if the Big 10 can have 11 teams, my Top 5 faves can have 6 logos. I guess the common thread here, (probably except for New Jersey), is that most people I know generally doesn’t “see” the entire meaning at first glance, but when they do, it feels satisfying; like being let in on a cool inside joke. At first, I didn’t notice the Whalers’ H, the Wild animal, or the Brewers’ m/b. It took years for me to notice the Atlanta Hawks logo was a hawk, not some sort of inexplicable basketball thingie eating some inexplicable other thingie. I still think Macon Whoopee choice of the fig leaf was a subtle and classy way to deal with what was otherwise a groan-inducing pun. With the mentioning of the Sun Microsystems logo and the WFL Sun logo, it reminded me of one of my favorite logos: Sun Oil Co. Not the Sunoco logo, but the one shown on the lease sign here: http://www.worthpoint.com/worthopedia/sun-oil-company-porcelain-lease-sign-1980s It’s simplistic, easily recognizable, works in color or b/w, works large (like the 50 foot tall version on the side of an oil storage tank near Seminole, OK) or small, etc. The Phillies’ greens were made special for that game every year and auctioned off every year. So Schenk is accurate in every quote. The unis WERE made special for that game and Giles had the idea for the uniforms. Schenk never said WHEN Giles first had the idea. Why do some players for Nevada have a helmut stripe and some do not? They earn them for special play. I don’t recall the specifics but it was covered earlier in the year. Did anyone notice SMU lineman Ja’Gared Davis has J.G. Davis nameplate on the back of his jersey? Anyone know what color pants Arizona is wearing with white helmets and white jerseys in the holiday bowl? From the links to the UA equipment manager blog, it appears they will also be wearing red socks. I’m thinking that the switch to white helmets is to facilitate a lame “white out” game with white pants, but I think white-white-navy would look solid. Merry Christmas fellow watchers, and to all a good night! So…a mentally unstable woman knocked down the Pope and a Cardinal during Christmas Eve mass at the Vatican, I heard. Have seen only grainy video so far, but being it was at the Vatican, can we assume the Cardinal was in the home whites? [quote comment=”368490″]So…a mentally unstable woman knocked down the Pope and a Cardinal during Christmas Eve mass at the Vatican, I heard. Classic whites with gold trim. Cardinals with red skull caps, the pope (or “B16,” as some of the kids call him) with a white skull cap and red shoes. New translator for the NBC broadcast. Not used to a new voice after years of Archbishop Foley. 5. A clean, upbeat look. Combining the City/State/School ID with the team ID in a classy, uncomplicted, easily identifiable way is a very difficult, tricky task. This logo pulls it off in spades. That to me is all that you can do with a team logo, and IMO that logo has it over any other one that I have ever seen. My second choice is the WFL Portland Storm, with the two piece “Hurricane “S”. Wonderful logo for my favorite WFL team. Where is RB Rufus Ferguson when we need him! [quote comment=”368494″]All-Time Sports Logos …. Agree. Flames A was one of the all-time greats in my book. Whalers logo is one of the best ever. It’s a shame and a sham that they ended up in Carolina and that the governor that signed the deal to let them go is now on the board of director’s of the owner’s company.